Sam Hankins graduated with a Bachelor's Degree in music performance and a Bachelors Degree and a Masters Degree in music education. He performed in the Glenn Miller big band and with artists such as The O'Jays, Aretha Franklin, Kool and the Gang, The Temptations, and The Dells. Sam has more than one iron in the fire. Dream Catcher (2011) might find your attention at CDBaby. His smooth jazz CD Nothing Between Us was released in May 2012. The latter is available via his website. Sam returned to Chicago in the fall of 2010 and was hired as Band Director at Christ Our Savior Catholic School, where he is still teaching his students. 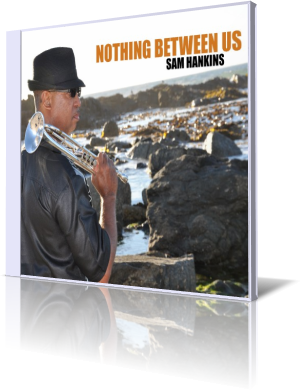 A dose of Herb Alpert, a pinch of Rick Braun and a big extra bonus of Tom Browne, that's Sam's Nothing Between Us. A crystal clear trumpet leading into a captivating song. The hypnotic We Come Together backed by a striking percussion groove holds the vibration on a high level. On the horn loaded See Me Hankins relies on muted trumpet and some atonal harmonies. The female vocals remind me of the Indian singer Falu (Global Noize). I Can Be features Sam's brother Marcellus Hankins, who stands out with a distinguished voice. Hankins loves the flow. Soft Touch is a good example for his mellow jazz with a relaxing, intriguing rhythm. Sam loves the dichotomy between his trumpet formed melody and the strict rhythmic background as shown up on Reach For Me. Give It A Try sees the separation of the melody line and a historical essence in the style of the groups he often supported in the past. Personally I prefer the integration of melody and rhythm on Where I am. Sam tends to expand his melodies in details, which certainly requires a little muse for listening. In our fast-paced time most love it however fast and crisp. On You Should Have he turns on the speed tap, which adds benefits to the entertainment value of his album. However, sometimes you do not know in what direction he wants to go. The urban funk approach of Get Back Step Back needs a bit dirtier play of trumpet. Away from the wake-up call to a dynamic funky performance. Sam Hankins' Nothing Between Us leaves me with mixed feelings. While the first two songs have blown me away, he can not keep this tension on the rest of the album.